John Milton Whitehead was bone on March 06, 1823 in Wayne County, Indiana. He was the Chaplain of the 15th Indiana Infantry at the Battle of Stones River Tennessee. On December 31, 1862 On April 04, 1898 he was awarded the Congressional Medal of Honor for bravery at the battle. His citation reads in part: "Went to the front during a desperate contest and unaided carried to the rear several wounded and helpless soldiers". 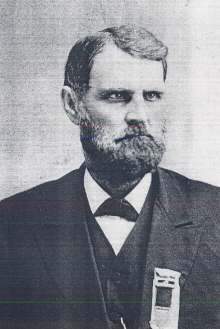 Chaplain Whitehead is buried at the Topeka Cemetery - Topeka, Kansas.